Very nice! 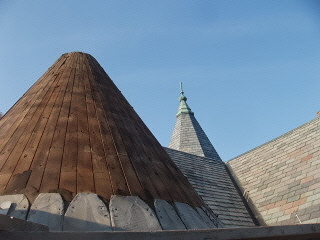 We're doing an octagonal turret in June, can't wait to get started on that! 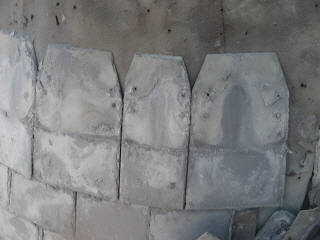 Here are a few pictures of the two turrets as we worked them in. 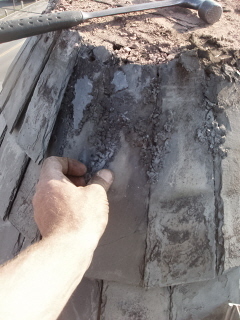 We installed them the way we found they, (no flashing at the top) capped with the same clay cap. The course change a little at the both, were I didn't get the rigth info for the over hange I think, which made a few smaller coures. 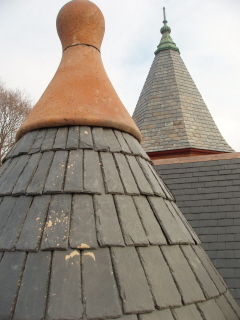 The 3 1/4 also had to do with the roof lay-out as a whole, in relationship to the finials. 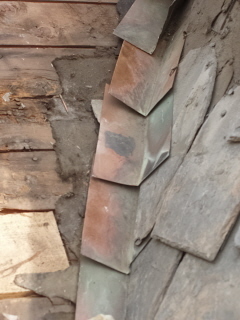 All these picture so far are the old slate roofing. 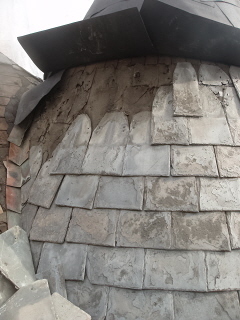 The new slate I have put on have been cut about the same and lay flat. Liam, the head lap shouldn't make any difference as far as the pieces are concerned. As long as everything is consistent. Looking at one of your pictures, it looks like you may have to trim the top corner of the slate a bit more. If they are not just "so" they have a tendency to rock back and forth. Also, make sure and drive the nails so that they are equal on both sides. Don't drive one snug if that makes the other side hold away from the roof. If it just won't work, you have to use smaller pieces. Patience is the key on doing one of the cones. With the jig, the angle is right and consitent so trust it. Sometimes if it just isn't working I take a slate for about 4-5 rows higher and tack several of them on. If they fit and go on nice, you know that you just have to make smaller pieces. It all goes back to the largest piece of slate that you start with. 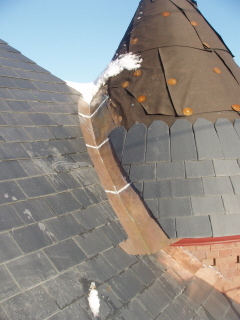 This thread and Mr Crookstons article are very helpfull for installing on conical areas/ turrets. Issue #4 has some other usefull tricks and ideas when dealing with this on a smaller scale.. So far the story pole has work, only having to ajust the courses here there. I made the headlap 3 1/4" for the whole turret so that I could change the courses as needed. I have had to trim a few here there. Here my story pole, just like Joh Crookston in the new TRM #7 talks about. You should be able to see my marks for course lay-out, to how may per course(My turret has a cricket or valleys in the back changeing the number of slate as you work in the first 10 or so courses, then it stays the same. ), and the size of slate needed to cut the course you are on. So, in my case I had started with 10" slate, instead of cutting just 10" slate. 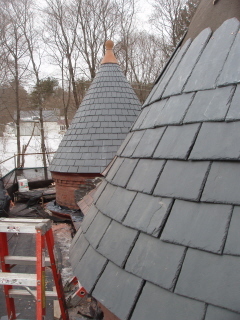 I had 10", 8", and 12" to minimize slate waste. We are in the middle of doing these two turret, and though that all the picture I take it would just make a good post for the message board. We cut all are pcs of slate in the shop. 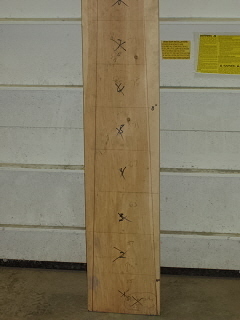 We made a story pole on site with courses and size lay-out. 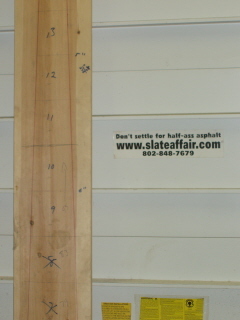 Then with the story pole we cut the amount need on rain days in the shop, minimizing waste. We are installing North Country Black which there is little waste any ways. I am about 1/2 done one and 1/3 the other, and will post some more as I go. Liam, what are you doing with it? 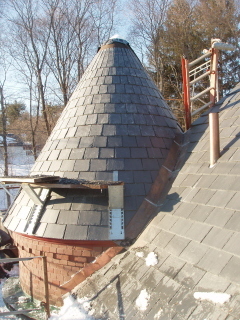 The first slate project I ever worked on was a turret like this. Baptism by fire!